Marie-Claire Andrews is co-founder and CEO of SmartShow, the company behind the ShowGizmo mobile application platform for event organisers. As I’ve mentioned previously, most of the people who contact me about a start-up idea do not have the skills themselves to actually make their product a reality, and so are looking for an introduction to developers who they can work with to develop their idea. SmartShow was created to provide event organisers with an easy way to make their events more successful, using smartphone apps. We knew it had to be easy because event organisers aren’t generally particularly tech savvy, it had to be great value because they’re watching every dollar they spend; and that it had to deliver benefits to all their stakeholders because a live event is a delicate balance of happy punters, happy exhibitors and happy sponsors. So we built ShowGizmo, a reusable content management system the event organisers use to populate native mobile apps for their events. The apps enable participants to exchange information and brochures, connect/make meetings, plan their time, receive news, alerts and Twitter feeds, collect leads, measure ROI, view reports, rate speakers, download presentations…before, during and after events. 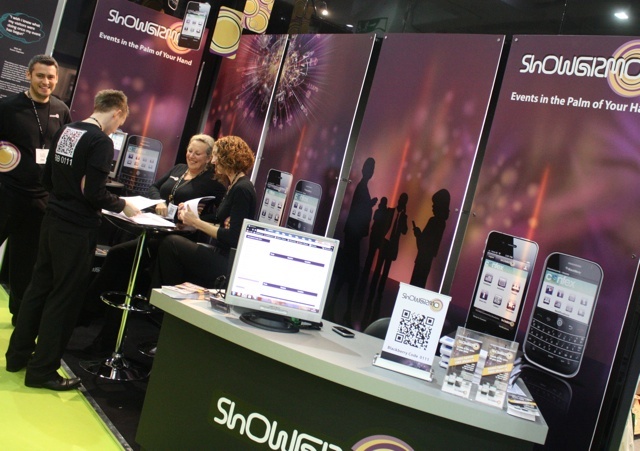 Our ShowGizmo apps are always in the stores, a little naked template populated with data the event organisers load. Our solution lets organisers demonstrate how 2012 they are by having an app – without having to pay $$$ and put in time they don’t have to build a specific app for their specific event. We make money by selling annual licences for ShowGizmo to event organisers. The price depends on the anticipated size of their events during the year, and sometimes they’ll pay for us to enter data, or be at their event, or to provide a helpdesk. Our clients might on-sell access to ShowGizmo to the brands they are organising events for – making money from our service – or they can seek a sponsor for the apps in the same way they get delegate lanyards or the satchel sponsored. We also whitelabel the system completely – smaller venues in particular like this as they can have their own apps, and on-sell access to the system to all the events they host. We started selling ShowGizmo before the product was finished. Lots of sizzle and barely any steak to be seen. In fact we started selling ShowGizmo using brochures and the website and sheer belief and enthusiasm for what it could be. We powered the biggest international event for event people, in the UK, after only two other small events. I’m glad we did that – we staked a claim in a fast moving market and got our brand out there. As a result we’ve been building relationships with potential exit partners and alliances for long enough to build excellent trust. And as our sales cycle is long (event organisers invest in annual if not two-year cycles) we’re now reaping the rewards of all that prospecting in the form of 40 clients, 60 events and $450k of proposals under consideration. The risk of doing it that though was not being able to deliver a great product. And we came very close to doing exactly that. A bad choice of development partner meant we wasted almost six months and I’ll leave to you guess how much money, on a product which had to be rebuilt. Twice. A process which left the founders exhausted, broke, despondent and with our reputations on the line. Credit cards and loans and dogged belief in what our service and product could be, rescue in the form of a fantastic developer and a commitment from a new CTO squeaked us through. We were still at risk though – with our shareholder funds depleted we were relying on revenues to provide income to pay our developers, in order to keep the product relevant and useful, and revenues were slow in the first part of this year. This is where the foundations for what will make us a success were really built though – great relationships. People liked us enough to enter into revenue share agreements, sweat equity agreements, free advice, introductions and frankly moral support (which was often the most critical thing to just keep us going!) Without those great relationships we would have sunk without a trace. And it was through those relationships we raised our capital, as we faced the typical start up conundrum; founders needed full time/founders needing to eat, more resource needed to develop sales pipeline/no resource available that’s not already working 18 hours on the company and four on consulting work. I believe that our investors are definitely investing in our experience, abilities, determination, reputation and track record in business – I don’t think that any of them are truly lit up by smartphone apps for events in all honesty. But their capital – and our lead investor from the UK – has helped us hire a team, finish the apps to meet the vision we had 12 months ago, secure a strategic partner in Australia and market the heck out of our offer. We decided to raise money because we had a window of opportunity to nail the deals in our pipeline, because a number of competitors were emerging and because the winner in our game is the one with the relationships and we couldn’t allow anyone else to sneak in and take those from us – but they need constant nurturing which means time and getting on planes. A lot. We also raised money to free the founders from juggling other jobs along with building the company. We did that for a year and stayed just about sane because of supportive family, partners and celebrating each little success as much as we could. Eyes on the prize approach. But we came close (within days) to closing – although looking back, I can’t see how it could have been different. We had to get a track record to convince investors, and that took time. And the positive was that the hiatus on development allowed us to built up the killer spreadsheet of what our clients actually wanted us to build. So when the cash came in, we could fulfil their every desire, and not waste money on features they would never buy, but that we fancied adding. As a business, one of the best things we’ve done is sell from the start. Even though it was risky. I never understand why advisors tell software companies to focus on Wellington, and then expand to Auckland and then maybe Australia! If your product sells, then sell it. To anyone. Anywhere. The more you sell the more you learn. How will you know your profit margin and the accuracy of your pricing structure and the resources you’ll need to grow if you haven’t deployed, if you haven’t supported? We have agents in the UK, Bahrain, Dubai, Australia and South Africa. We sell more offshore than in NZ – three times more. A trial in New Zealand wouldn’t have taught us what we need to know about selling in the Middle East, so what would have been the point? Do it, learn, do it better. International clients also don’t find NZ case studies compelling, so they’re not hugely valuable for that even, sadly. The future for SmartShow is exciting (as all entrepreneurs say, right?!) Since raising funding, we’ve hired a development team, a marketing exec, a production manager and added agents in the US, Kenya and Thailand. We’ve knocked off most of the killer features on the spreadsheet and are actively courting the company we hope may provide our exit. I’ve travelled to the UK, Australia and Middle East and there’s more to come next year – which I love. I want us to maintain our reputation as the nice guys on the block, with the great product that people actually use again and again. Most of all though, I want to work with an awesome team, put into practice all the things about starting a business I’ve advised on, read about and heard presentations on, make a million and do it all again. Although you sound 6 months to a year ahead of my curve, I too am having/have had all of the issues around financing/investment, sourcing talent, forming alliances, product dev ups and downs, product release dilemnas etc with my own software venture. But hey – it’s a lot of fun, and like you I’m glad to be bringing some business experience along for the ride as otherwise it would be extremely scary. I look forward to hearing about that exit you’re courting already!